Your grocery bill may not rise by quite as much as Canada's leading food price experts expected this year, but there's one section where you should expect to pay even more: the butcher. The researchers behind Canada's annual Food Price Report, published by Dalhousie University, say that while they have downgraded their expectations for food inflation this year to between three and four per cent, meat prices are set to increase by much more: up to a range of between seven and nine per cent. "We have noticed that some cuts have increased in prices by as much as 20 per cent since January," lead author Sylvain Charlebois said in the semi-annual report released Monday. Prices have increased at the wholesale level, but so far, the full impact of those hikes haven't been felt at the retail level. But that can't go on forever, the report says. 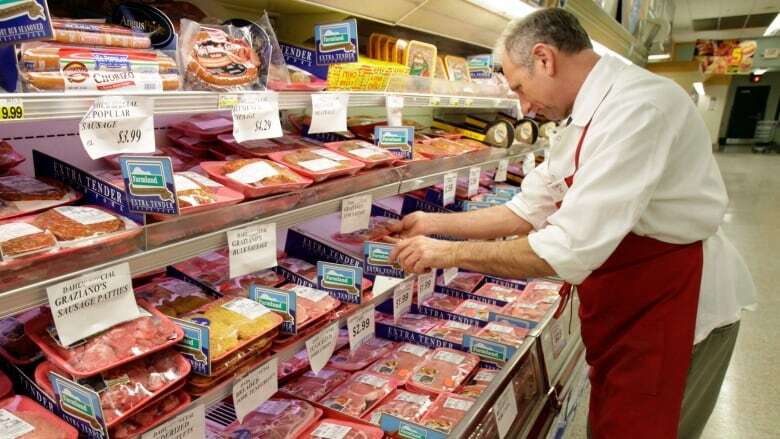 Chicken prices are expected to remain stable for the rest of the year, but the same can't be said for pork and beef, which are all set for sharp increases in the coming months. There's good news in other aisles, however. In general, prices for vegetables, dairy, eggs, cereals, fish and other seafood have decreased by more than expected this year, which is why the overall bite to your grocery bill won't be as deep. That's not to say there aren't exceptions to those trends. Lettuce is turning out to be "this year's cauliflower," the report says, as prices have spiked because of water problems in California, where much of the U.S. crop comes from. "The excess moisture and pests this year have led to crop losses. Lower inventories, coupled with higher demand for greens in the spring increased prices for lettuce, celery and other produce," the report found. Officially, Canada's inflation rate sits at 1.6 per cent, according to Statistics Canada, and according to the data agency's numbers, food prices have actually declined in the past 12 months. But that does jibe with the Dalhousie report's findings — in part because they track the numbers in different ways. Statistics Canada comes up with its inflation number — known as the Consumer Price Index — by using interviewers operating out of regional offices across Canada, who record data points for food products. According to their website, Statscan tracks prices of brands and varieties that sell in the greatest volume. So if a certain brand or type of baked beans, for example, is the one the agency tracks, price changes for that brand are what gets registered — no matter what happens to other brands of beans. The Dalhousie report, meanwhile, gets its numbers with random spot checks of 100 different items that may not be included in the official consumer price index numbers. And the difference between the two numbers is large. Statistics Canada says meat prices decreased by 2.1 per cent between April 2016 and April 2017. But Dalhousie's numbers show an increase of 11 per cent between January and May of this year. Fish and seafood, meanwhile, were three per cent more expensive between April and April, according to Statistics Canada. But Dalhousie's random spot checks suggest they actually got four per cent cheaper in the first five months of the year. Canada's inflation rate: How do they calculate it, anyway? Vegetables were 5.5 per cent cheaper, the official numbers show. But Dalhousie calculates they have actually increased by eight per cent since the start of the year. In virtually every category of food prices, Statistics Canada's numbers don't line up with Dalhousie's price checks, which the report says causes people to doubt the numbers when they compare what they read in the news with what they see at the store. "The Consumer Price Index was never meant to be perfect," the report says. "However, this year, with food inflation, the CPI seems off, way off." "Nobody is trying to mislead anyone, but food affordability is something most Canadians think about almost every day. Second guessing what may be happening to their grocery bill is not something we should accept."